The recipes John suggested to make and preserve were apple butter and a tomato bruschetta. I contemplated making apple butter, but as both of these recipes were for things that usually top bread or toast – something that is a rarity in our household – I opted for something that would be more popular and useful for our family in the coming months. When I visited the farmers market and scored a huge cardboard box full of “sauce-ready” (meaning less-than-perfect) tomatoes for $10, the deal was sealed. I was going to can salsa. I have prepared salsa many times on the fly for meals during the summer months. With fresh tomatoes, jalapenos, and herbs, how could I not? But when winter comes, I’m forced to buy jars of salsa from the grocery. While I’ve found some decent brands, nothing compares to salsa made with ingredients at the peak of freshness. I have not spent a great deal of time canning in the past (I’ve made pickles and jam, but that’s about it), but I had the general process down, so I got started. First step was roasting some of the vegetables. While it’s not mandatory to do so, roasting the veggies gives the salsa more depth and an oh-so-subtle sweetness. This took a while, as I had a lot of tomatoes. But the blitz in the food processor was easy (gotta love food processors! ), and then my attention was turned to canning the salsa. And of course, the best part – listening to the cooling jars for that satisfying “pop” of the lids, ensuring that my jars were sealed and I was successful! 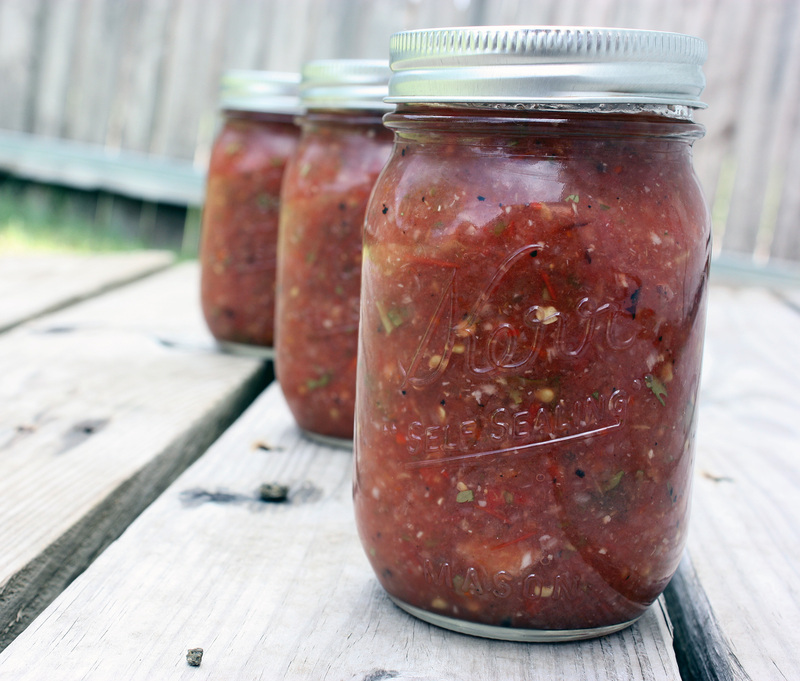 This recipe is for a large quantity of salsa (it makes about a gallon! ), but of course you can cut it back to suit your needs, and of course, you don’t have to can it. It’s excellent eaten as soon as it’s made. Of course, if you do choose to can, you’ll have that satisfaction of knowing that in the gray, chilly days of February, you can open a jar and taste the freshness of summer all over again. Preheat the broiler in the oven and place the top rack about 6-8 inches below the burner. Line rimmed baking sheets with foil. Place tomatoes, garlic cloves, halved onions, and peppers on the baking sheets and broil, turning as necessary, until skins are blackened and tomatoes and peppers are soft. Remove and allow to cool. (You will likely have to do this in batches) Remove skins from garlic cloves and onions, and remove skins and seeds from jalapenos. Place vegetables in food processor and process until no large chunks remain. (If you like a chunkier salsa, you might like to pre-chop the vegetables so that you don’t have to process in the food processor so long. We like a thinner salsa, so I just let it nearly puree the vegetables.) You will likely have to process salsa in batches as well. Place in a large bowl and add in cilantro, lime juice, and spices. Stir and taste. Add salt as needed and stir. To can: Heat clean jars and new lids in simmering water for at least 10 minutes (this will prevent the jars from breaking and will help to sterilize the jars). Prepare the canning pot by bringing water to a near-boil. Remove the jars from the water and fill the jars with salsa, leaving about 1/2 inch of headspace. Clean rims of jars well and add lids. Screw the threaded lids on the jar until fingertip tight. Lower the jars into the canning pot and make sure they are covered by the water by at least an inch or two. Bring the water to a boil and process for 12 minutes. Remove and place jars on a towel on the counter. Allow to sit and come to room temperature for 12 hours. You might hear the lids pop – this is a good thing. Check the jars to ensure they sealed properly – the lid should be concave in the center. Remove the threaded part of the lid and attempt to lift by just the lid – you should be able to lift without the lid coming off. If the lid comes off, then reprocess or refrigerate and use within a week or two. Makes about 8 pint-sized jars of salsa. This post is linked to Real Food Weekly. I am honored to say that I am guest blogging over at Simply Sugar and Gluten Free today. 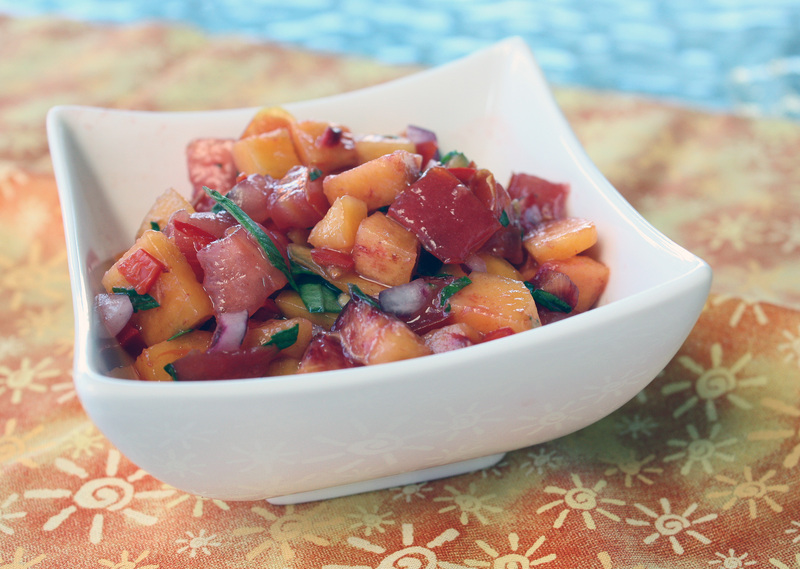 Come on over and check out this super-fast peach salsa and celebrate fresh summer produce before it’s gone! Bottled salsa. I’ve bought many a jar in my day. I think most of us have. In fact, many of us have a bottle sitting in the fridge right now. And for convenience’s sake, a bottle of salsa is a great, healthy, go-to condiment, perfect to accompany tortilla chips, scrambled eggs, tacos, or even to top a piece of grilled chicken. But we all know that bottle, no matter how fancy the label, can never be quite as tasty as a freshly made salsa. Sometimes, you just need more. In all honesty, salsa is not that hard to make. If you have a food processor or blender, it’s a snap. And when making it from scratch, there is no limit to the varieties of salsa you can prepare. Different vegetables, fruits, and spices can be used to create new experiences, and you can use them raw, simmered, or even roasted to bring different flavors to your salsa. Because of this freedom, it’s not very often that I make the same salsa twice. Hence the reason for another salsa verde recipe. My first was in response to the Hatch chile season (which is fast-approaching!). This salsa was created as an accompaniment to some marinated, grilled fajitas we were having for dinner the other day. (Sorry, no recipe on that one…I cheated. A Latino grocery I have been visiting a lot lately had marinated beef fajitas on sale for $1.97/lb…couldn’t pass it up. They were pretty tasty though, I have to admit. And my visit to that grocery also allowed me to find some wonderful tomatillos, which led me to this salsa.) With an abundance of fresh serrano chiles that I picked up at the McKinney Farmer’s Market, this salsa was born. Preheat broiler. Place tomatillos and serranos cut-side down on a foil-lined baking sheet. Place under broiler, about 10 inches away, for about 10 minutes or until the skins are lightly blackened and there is juice coming from the tomatillos and peppers. Place all ingredients into a food processor and pulse until everything is finely chopped. Season with salt to taste. Serve warm, or cool in refrigerator. It’s Hatch chile season again! What does that mean? Fresh New Mexico green chiles, of course. Even though Hatch, New Mexico (the famous city for which the chile’s “name” originates) is quite far from my home in Wylie, Texas, the grocery stores still have these fresh chiles for dirt-cheap everywhere (I visited my closest grocery store today and saw they had a box of fresh chiles the size of a file box for $8!!). But what to do with them? In my mind, make salsa, of course! It’s terrific with chips, although I did make so much I may decide to make some enchiladas with the rest. This recipe for the salsa is adapted from the recipe at Chuy’s restaurant. Add more or less serrano chiles, depending on how hot you like your salsa. Put all ingredients except salt and lime juice into large pot and bring to a boil. Reduce to medium heat, and cook for 30 minutes. Strain into a large bowl. Place solid ingredients and about 1 ½ cups of the strained liquid into blender in batches and blend until smooth. Add lime juice and salt (add a bit and taste each time) and blend. Chill and serve. ** to roast chiles, turn your broiler on high, and broil chiles until skins blacken, turning every 4-5 minutes, until the skin is mostly.charred. (about 70% charring) Place the chiles into a large bowl while still hot, cover tightly with plastic wrap. Let sit and cool for 10-15 minutes, and then the skins of the chiles should peel right off.